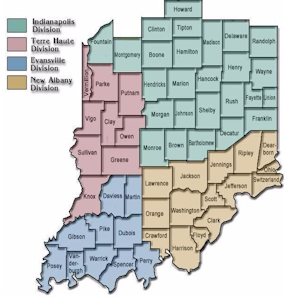 The United States District Court for the Southern District of Indiana exists to facilitate the resolution of disputes under the law, protect the community, and provide equal access to justice for all people. The court has 5 active District Judges, 1 Senior Judge, 5 Magistrate Judges and 2 part-time Magistrate Judges. Court proceedings take place in Indianapolis, Terre Haute, Evansvile, and New Albany. 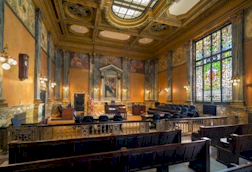 Appeals from the court are heard by the United States Court of Appeals for the Seventh Circuit. Information on this website is provided to assist the public and the Bar in conducting business with the court. News and noteworthy information may be found under News & Announcements on the main page. Please note that in addition to the Federal Rules of Criminal Procedure and the Federal Rules of Civil Procedure, the court's Local Rules govern the conduct of all actions filed in this federal court . NOTE: Links to additional web resources are provided on this site as a convenience. The U.S. District Court takes no responsibility for, and exercises no control over, the organizations, views, accuracy, copyright or trademark compliance or legality of the material contained on external websites. The content of these sites does not necessarily reflect the opinions, standards or policy of the U.S. District Court. Any questions or comments concerning external sites should be directed to those institutions.